This is a 2005 Cartier Louis Cartier Limited Edition No. 6 cartridge/converter-fill in solid 18K gold in Godron (heavy fluted) pattern. Three sapphires and two emeralds set into the clip. Black cabochon on barrel bottom. Two-toned, 18K, medium/fine nib. New-old-stock. Mint in box with velvet pouch, papers, outer box and letter of authenticity from Cartier. Check out our Catalog to view this item’s availability! Item #8 in Catalog #86. This is a 1947 Ancora Lusso 38 Large PIF in Black with Blue Marble veining (unique and beautiful!). Lusso was Ancora’s prestige line at the time. GFT. Visualated barrel. 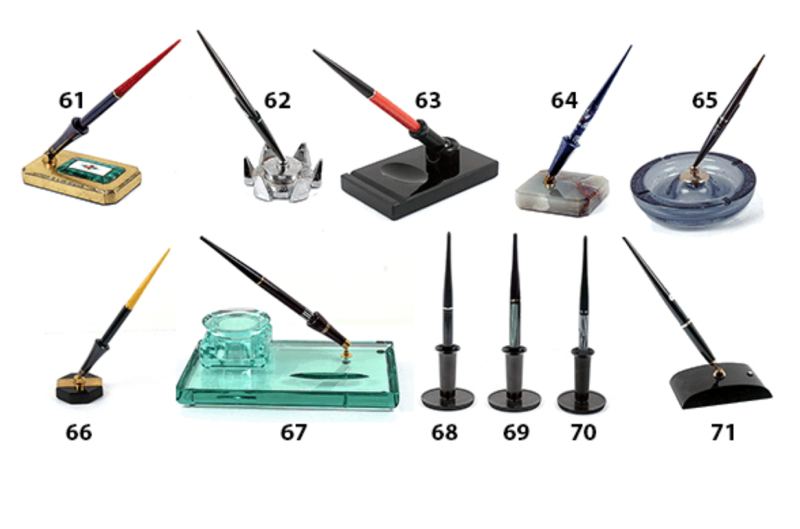 Fine, extra-flexible nib. Over-the-top “Soldier” clip. Near mint. Check out our Catalog to view this item’s availability! Item #7 in Catalog #86. 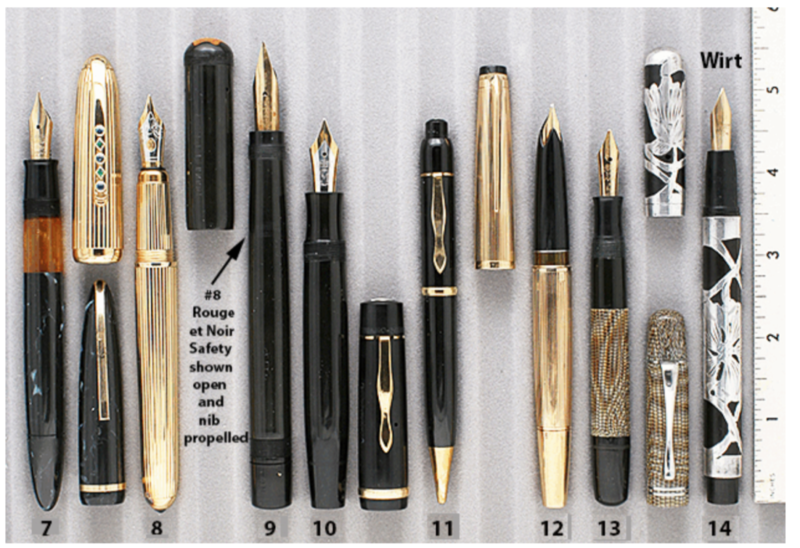 This is a 1910 Waterman – “World’s Smallest SAFETY Pen” eyedropper-fill in Black Hard Rubber. Yes, it has an operating spiral, just like any of the larger size production models! 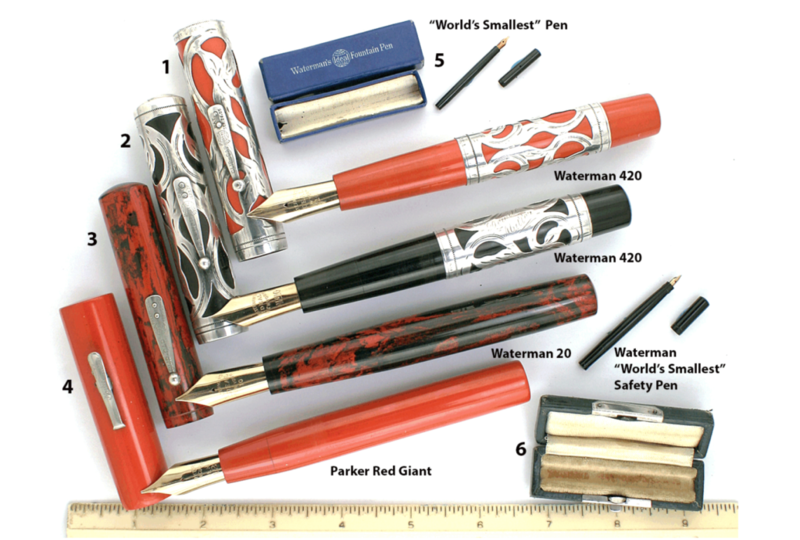 See above for more information about Waterman’s World’s Smallest Pens. Near mint+, and extremely rare, especially in the original cardboard box! Check out our Catalog to view this item’s availability! Item #6 in Catalog #86. This is a 1954 Montblanc Model 204 Desk Set 3″ x 4″ black glass, half oval shaped, sloping from middle to both the front and the back. PIF pen with original nib size barrel label, hooded nib and visualated barrel. Medium nib. New-old-stock. Mint in form fitted box. Check out our Catalog to view this item’s availability! Item #71 in Catalog #85.